A mission is filled with many highlights and as soon as you say, "This is the highlight", another one comes along to unseat it. I'm pretty sure nothing will unseat the highlight week we just finished with my sister Sally and her husband Doug. It's pretty cool when your sister will come all the way to Romania to visit you. I love you, Sal! We traveled by train and rental car and visited some very quaint places. Here, Sal and Doug aren't even aware they are being watched by the "Eyes of Sibiu"! We toured Peles Castle in Sinaia. We stopped in a little village and visited a sculpturist in his studio. Sally bought a nativity set and I bought a sculpture of a Romanian woman. I'll ask "why" later. No road trip is complete without a wrong turn and we made more than one! We found ourselves on Pot Hole Lane going through village after village at milking time! Luckily, the cows were equipped with headlamps! What are THEY staring at? Ever seen a tourist? It was all eye-candy for us. We climbed many a clock tower to see the sights of the city and to be in a tower built in the 1500's with a clock that still ticks! 130 stairs and it's worth it! This is Sibiu. No trip is complete without Kurtos--a delicious bread rolled on a wooden spool and cooked over coals then rolled in sugar and nuts. 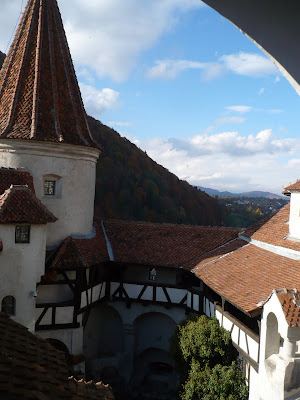 This is Bran Castle. Smells like Dracula. We were interviewed by the NBC Today show for the Halloween special. Sally smiles before disappearing into the secret passage. She's so brave! We couldn't resist visiting this 13th century Rasnov fortress. We climbed about a zillion steps to get here and it was all worth it! Just wondering around something so old is fascinating. It was built by Teutonic Knights! Imagine! 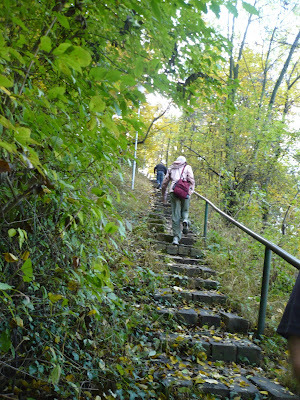 These steps went on forever. Luckily, it was a beautiful Fall day and the colors were in their prime. We walked down the mountain on this cobblestone lane. It doesn't get better than this! Watch out New Hampshire! Romania is so amazingly diverse. We're pretty sure Sally and Doug enjoyed the tour. We, for sure, enjoyed our week-long P-day! We needed the break and we loved sharing our beautiful country with our favorite traveling accomplices. Sally brought the Rook cards and train time just flew by. Thanks for coming to see us, Sally and Doug!